Executive Apparel is well-known provider of school uniform solutions and tailored apparel for the career workforce. As uniform outfitters we supply tailored apparel to private schools, charter schools, groups like academic, arts or sporting clubs, leadership groups and career professionals. The case studies below show the challenges our clients faced in warm weather climates and the solutions we provided. To increase Executive Apparel’s reach in the southern states, we recently introduced a blazer specifically for this type of end-user. The JET Unlined Tailored Blazer was inspired by our signature UltraLux 1000 & 2000 style blazers but designed for a client with a tight budget who wants a tailored look. Working with our distributor, a Florida Charter School inquired about a professional-looking blazer that was appropriate for a hot climate. Thanks to some recent research and development, we came up with an excellent in-stock solution to a universal problem. Most tailored blazers are fully lined, making them uncomfortable for hot climates. With a professional look and a lighter weight, our JET unlined blazer was perfect for the school. There are many benefits to the JET Blazer besides its weather-friendly lightweight design. This alpha-sized blazer simplifies the fitting process for administrators. The price-point is lower than our lined UltraLux blazers. An alpha fit-line costs much less than a full-sized fit-line. The Jet also ships in economical polybags rather than on hangers in large costly boxes. Those valuable elements closed the deal for our customer’s Charter School program. The final product was a sophisticated climate-appropriate garment that fit their vision and budget. Another climate-related request came from a medical facility in Louisiana. 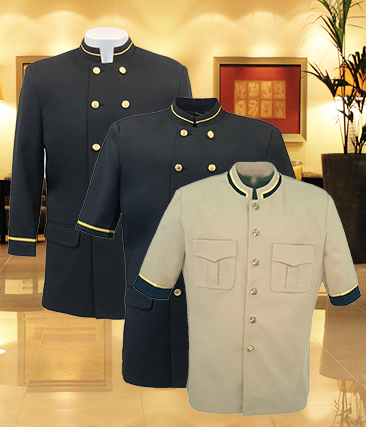 In need of multi-season valet uniforms, the buyer asked for matching custom uniforms for multiple seasons. After some discussion about fabric weights and embellishments, we designed a set of matching valet jackets, a short-sleeve version for spring and summer, and a long-sleeve version for when temperatures dropped in fall or winter. Our goal was to present a consistent professional look, whether a valet wore the short or long-sleeve jacket. A third design was added in a matching style with contrasting colors for a porter position. The 3 garments created a cohesive first impression that was professional and comfortable for employees. If you have a client that is requesting an unusual project contact the team at Executive Apparel for guidance. Click the link below to open your free Distributor Account and learn more about uniform programs. Where Do All the Uniforms Go?